When I looked down the clear lid the lipstick looked like the MUST have orange lipstick for my holiday, boy was I wrong! 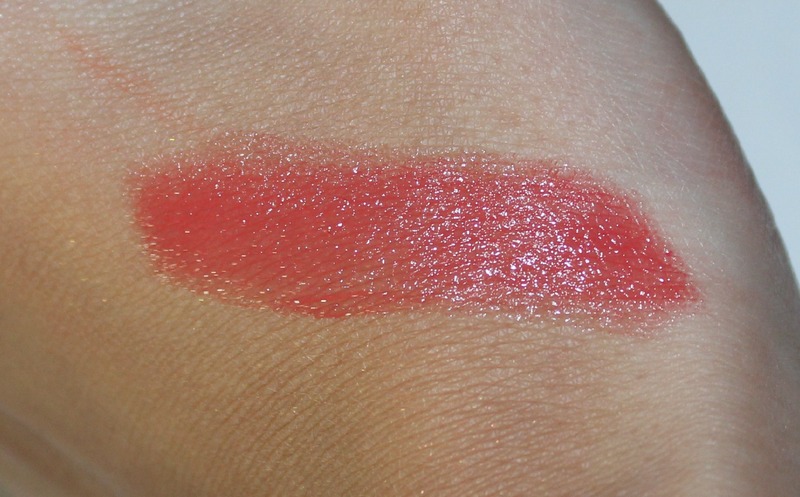 I was so disappointed when I swatched this lipstick as I didn't realise it was more like a lip tint than a lipstick. I wanted something similar to the MAC lipstick in Morange. Carnival Spirit is one of Revlons 'Super Lustrous' lipsticks, which I didn't know at the time! That will teach me for just picking things up from random counters, in random places. The Super Lustrous lipsticks look like they would be super pigmented, but they aren't really and they do apply sheer. The swatch above was swatched back and forth quite a few times for that pigmentation to show, if you like your lips with a hint of colour you may love this lipstick. Now I have quite dark lips so lip tints aren't really something I ever reach out for as they don't do me any justice what so ever. This is what happens when I don't look at swatches before I buy. The lipstick isn't very long lasting on the lips either, one swig of a drink and it's off. I would of loved this lipstick in a matte finish, just imagine how gorgeous the lipstick would be. Overall Revlon Super Lustrous lipsticks aren't really my cup of tea, but you may have a different opinion if you like this type of finish. It's such a pretty shade when applied over and over again. I wouldn't buy another in this finish anyway and it's taught me to look at the label before I buy ha! What's your favourite finish? It's a gorgeous colour, such a shame you have to apply it several times! I love strong and vibrant colours on my lips, I wouldn't even mind that they are quite shiny. I'm a big fan orange/y lipsticks, I have written a post on how to wear orange lipsticks, have a look if you want to. It does look a pretty shade but it wouldn't really show up on my lips as mine are quite pigmented too.